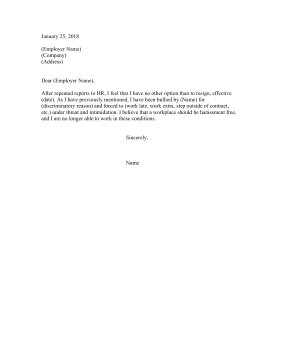 This sample resignation letter includes a brief complaint about being bullied and harassed in the workplace. After repeated reports to HR, I feel that I have no other option than to resign, effective (date). As I have previously mentioned, I have been bullied by (Name) for (discriminatory reason) and forced to (work late, work extra, step outside of contract, etc.) under threat and intimidation. I believe that a workplace should be harassment free, and I am no longer able to work in these conditions.